Sarita Gupta is the co-director of Jobs With Justice and the co-director of Caring Across Generations. She is a nationally recognized expert on the economic, labor and political issues affecting working people, particularly women and those employed in low-wage sectors. She is widely recognized as a key leader and strategist in the progressive movement. Under her direction, Jobs With Justice is expanding people’s ability to come together to improve their workplaces, their communities, and their lives by creating solutions to the problems working people face at both the national and local levels. Jobs With Justice leads campaigns, changes the conversation and moves labor, community, student and faith voices to action. Jobs With Justice has been on the front lines of successful organizing and policy campaigns to boost wages and working conditions for all working people, and improve labor and civil rights protections for immigrant men and women. 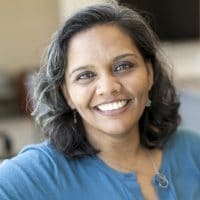 In her role with Caring Across Generations, Sarita spearheads a national movement of families, caregivers, people with disabilities, and aging Americans working to transform the way we care in this country. The campaign is calling for policy solutions that create a much-needed care infrastructure that provides high-quality, affordable options for people who need care, support for family caregivers, and strengthens the care workforce. As a member of the “sandwich generation,” Sarita grapples with and can speak to the care issues facing more and more Americans: Balancing caring for young children with caring for aging parents. Born in the United Kingdom and raised in Rochester, NY, Sarita currently lives in Silver Spring, MD, with her husband, daughter, and parents.